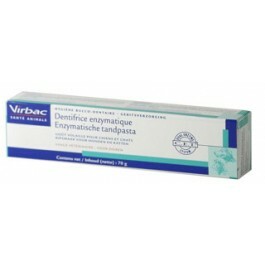 Virbac toothpaste is a Dual-Enzyme formulated poultry flavoured toothpaste for dogs. 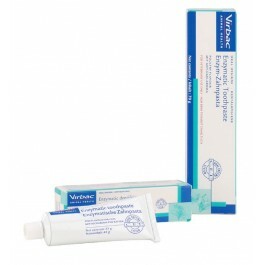 Virbac toothpastes are specially formulated for dogs. They are mildly abrasive and contain the CET Dual Enzyme System,a patented enzyme complex that activates and stimulates the natural defense mechanisms of the mouth to inhibit plaque-forming bacteria. They do not need to be rinsed away after application and are safe to swallow. Mouth odours are quickly neutralised. Different flavours are available that are well accepted by pets and in turn make brushing easier. Toothbrushing is the most effective method of removing plaque from your pets' teeth at home. Glucose oxidase, mild abrasives and poultry flavoured palatable agents, dextrose, xanthan gum, sodium benzoate, poultry flavour. If you have never brushed your dog's teeth before, you will need to be patient and put in some training time. It is best to start when the animal is young, but it's better late than never! Train by first using a clean cloth rather than a toothbrush. Hold a corner of the dampened cloth with your index finger and use a gentle, circular motion on the teeth and gums, while speaking to your pet in a calm and gentle manner. To start with, only do this for a few seconds, give the pet a favourite treat, and then repeat a couple of times. Each day, increase the time spent rubbing the teeth and gums until it approximates a good tooth brushing. Squeeze some Virbac Toothpaste onto the brush and allow the dog or cat to lick it off. Pull the lip up and gently rub the brush against the gums and lips for a few seconds. As for the training period with the cloth, take it slowly and reward your pet after every few seconds of brushing to begin with. Brush every day if possible, or at the least twice a week. Try and pick a time that you know your pet is likely to be relaxed, eg after a long walk, and when the house is quiet. prevent the formation of dental plaque. reduce the formation of tartar.